For breakfast I ordered a bacon and tomato biscuit. 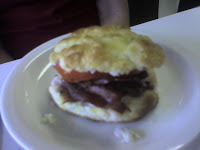 Now I love bacon sandwiches and I often make a bacon and tomato sandwich for lunch but it never occurred to me to make a bacon and tomato sandwich on a buttermilk biscuit. The bacon was perfectly cooked. I always ask for it to be cooked "crisp" and almost no one can manage that. It's either too chewy (ick!) or it resembles charcoal. This thick cut bacon came out perfectly. The biscuit was buttery and flaky and amazingly this early in the season, the tomato was red, ripe and juicy. Perfect start for a busy day. Dh had the eggs, bacon and biscuits and gravy and I couldn't quite decipher what he was trying to say through the moans of pleasure. And all the ladies working at the slab were friendly and helpful. All in all, The Slab was a big surprise. If you are ever in the Del Rio area, be sure to stop in! Slightly Cheaper Than Therapy: Sandwich A la "a wonderful, magical animal"